National Weather Service Issues False Tsunami Warning - Joe.My.God. A glitch meant some people received what looked like an actual warning, NWS meteorologist Hendricus Lulofs said. The National Weather Service is trying to sort what went wrong, he said. 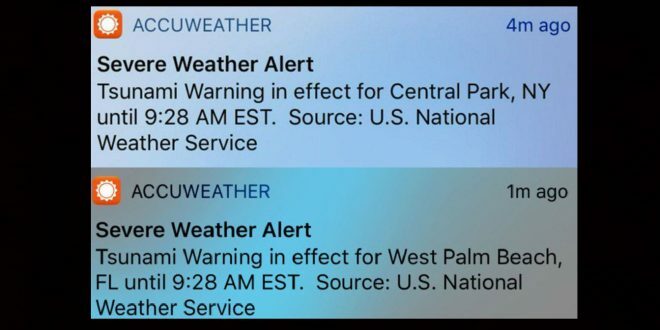 Officials said it appeared to be an issue with the popular Accuweather app. Accuweather didn’t immediately return a call seeking comment. This is the latest in a spate of false alarms in the past month. A Hawaii state employee mistakenly sent an alert warning of a ballistic missile attack on Jan. 13. And, a malfunction triggered sirens at a North Carolina nuclear power plant on Jan. 19.